One of the largest cities in Southeast Europe, Bucharest became capital in1862 and subsequently the centre of Romanian media, culture and art. As a result, there is a rich architectural mix and the city has been referred to as ‘little Paris’ due to the elegant buildings and the sophistication of its former elite. The best places to stay in Bucharest tend to be those closest to the centre. Unfortunately quite a bit of Bucharest was destroyed under communism, but the Old Town, around Unirii Square, survived and it’s beautiful. It also has some of the best restaurants, pubs, shopping, and some of the best places to stay in Bucharest. Primaverii is another beautiful and atmospheric part of town, but more leafy and residential, in fact expensive residential. If you’re looking for good value consider the Tineretului district, which is close to Tineretului Park - which is huge - and has good transport links. Why not start at the iconic Palace of the Parliament, which was constructed during the 1980’s when Nicolae Ceausescu held sway. This massive edifice boasts 1,100 rooms and is the largest parliament building in the world. There are museums galore; the Taranului (peasant customs and crafts), the Satului (village of preserved farmsteads etc. ), Istorie (of history going back to the pre-historic) to name but a few. Don't forget the neoclassical Romanian Athenaeum which is the centre for performing arts, or the 15th century Curtea Veche Palace, once home to Prince ’Vlad the Impaler’. Plus there are lovely orthodox churches, most notably the Stavropoleos with its decorative sculptures and amazing frescoes. The city is now enjoying an economic and cultural renaissance. And for this reason, it's a busy destination year-round. If you want to guarantee a room in one of the best places to stay in Bucharest, get organised and book well ahead. The Grand Hotel Continental is a five star hotel situated in the historic centre of Bucharest. Its rooms and suites are presented in traditionally elegant style with renaissance furnishings. There is a first class restaurant, function rooms etc. and, as you'd expect for a luxury establishment, there are very high service standards. 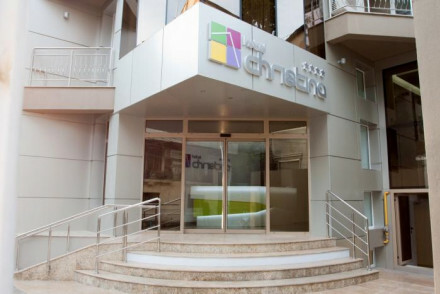 The Hotel Christina is a sleek, contemporary hotel with colour themed rooms, located close to the centre right by the National Museum of Art. 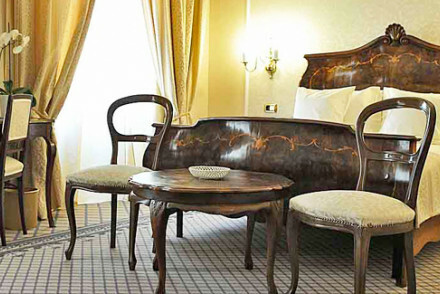 In total contrast, Hotel Scala boasts beautiful classic rooms with parquet flooring and sumptuous fabrics. It's a historic building right in the centre of the city with doubles starting from €75 per night B&B. Hotel Christina is a sleek, contemporary hotel with colour themed rooms, located close to the centre right by the National Museum of Art. It has all the mod cons, including a cafe and a restaurant, plus doubles start from just €69 including breakfast. Grand Hotel Continental is a five star hotel situated in the historic centre of Bucharest. Its rooms and suites are presented in traditionally elegant style with renaissance furnishings. There is a first class restaurant, function rooms etc. and, as you'd expect for a luxury establishment, there's a very high level of service. If you want to spend your days sightseeing then it's definitely best to visit in the summer months, with the average daily temperature reaching 22°C in July. However, this is peak tourist season so if you fancy visiting at a quieter and cheaper time then consider coming in May or September. International visitors can fly into Bucharest Henri Coandå International Airport, located about 18km north of downtown Bucharest. From the airport, either take the bus or the train to the city centre. Blue Air and Wizz Air fly from Luton to Bucharest, whilst Ryanair go from Stansted. Browse through our list of the best places to stay in Bucharest. Alternatively, widen the net to search through our list of the best places to stay across the border in Belgrade or Budapest. A contemporary Four Star hotel with simple rooms. Colour themed rooms have all the mod cons. Lunch cafe and restaurant, concierge, and massage service. A good value option for a stop off in Bucharest. Sights nearby - Cismigiu Garden, National Museum of Art of Romania. Traditional architecture, period furniture and antiques in every corner blend well with modern day comfort. It also hosts exhibitions, live music concerts and formal dinners. The Repertorium offers gourmet cuisine. Rustic-charm, great location and a lively atmosphere. Local exploring - A stylish hotel in the heart of the city, next door to Magheru Boulevard and the Royal Palace. Local markets - The markets in the old part of town cannot be missed, head out on foot and bargain hunt. Sights nearby - The Romanian Atheneum and the National Theatre are both moments away. 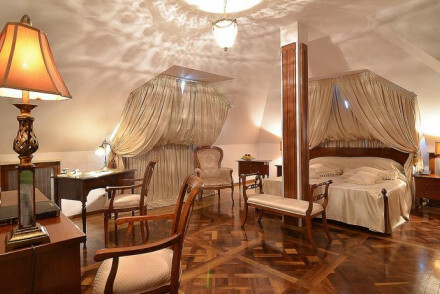 A grand Five Star hotel in Bucharest's historic centre. Traditional elegant rooms and suites have all the mod cons and Renaissance furnishings. Excellent restaurant, meeting facilities, and close to all the local attractions. Sights nearby - Cretulescu Church, Romanian Athenaeum and Cismigiu Garden.